Small tool, for extraction of PLCC16 to PLCC84 ICs. The both hooks are placed into the diagonal slots of the socket and grasps under the device. 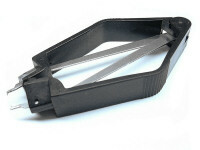 A smooth pressure at the patented tongs pulls out the chip without any harm.